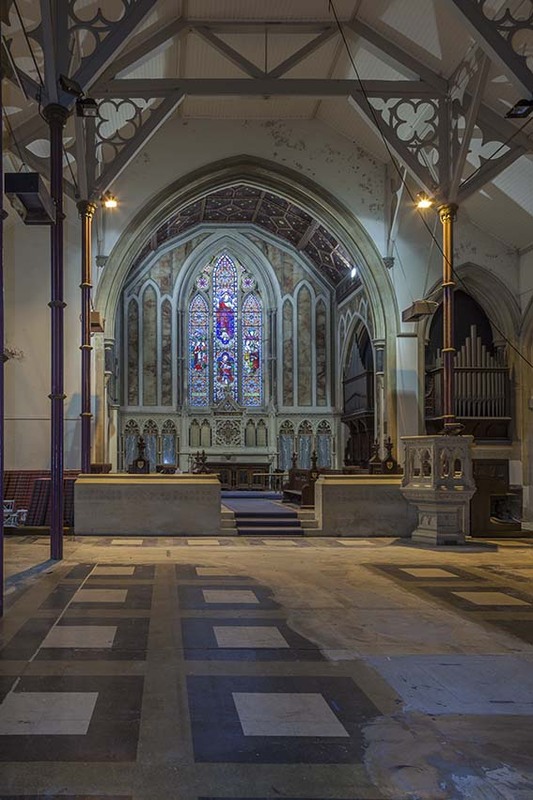 The church on the edge of Kemp Town was largely paid for by the first Marquess of Bristol, who had evangelical sympathies and resided in Sussex Square nearby (Sawyer III p111-12). He wished to found a church for the benefit of servants and similar persons, whereas the more fashionable went to St George‘s (Dale p97). It was also used by the newly founded and adjacent St Mary’s Hall School, for which he gave the land (ibid p96). The apparent date of the church, 1849, is puzzling, for its big lancets, galleries (now mostly gone) and tower which has a recessed spire behind a parapet with undersized pinnacles, were very old fashioned at that time. So was the nave roof, resting on thin iron columns with thin, straight roof supports with traceried spandrels. As built, it had a flat east end with three lancets (Quartermain (E) p10). Though in keeping, the west porches must be later, for they are not shown on a drawing of c1849 (ESRO Par 270/4/1). The exterior is finished with stucco, which was uncommon by 1849 as compared with a decade earlier. However, it is not smooth but textured to emulate rough-finished masonry. Sawyer provides the answer (ibid) to the various inconsistencies. 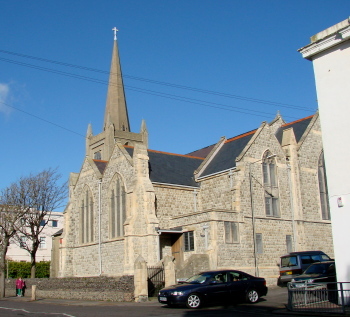 Though the church was consecrated in 1849 it was started ten years earlier, but because of difficulties with the Vicar of Brighton over its public use, stood as a roofed but unglazed shell until completed by the Commissioners for Building New Churches. The architect is not known for certain; though no source is cited it has been given to T Cooper (EH), but is not mentioned in his entry in Colvin (p274). Alternatively, Goodhart-Rendel’s suggestion of G Cheesman is plausible; both father and son designed churches. T Shelbourne, who according to Sawyer completed the church, was almost certainly a builder, though he has left no record. It is conceivable that the rough-finished stucco was a change that was made at this time to try and bring the church closer to contemporary notions. This complex building history may account for the relatively high cost of £6105 2s 9d, in addition to which by 1875 a further £1600 had been spent on ‘restoration’ (PP 125), though the nature of this is hard to establish beyond the presumed addition of the porches. 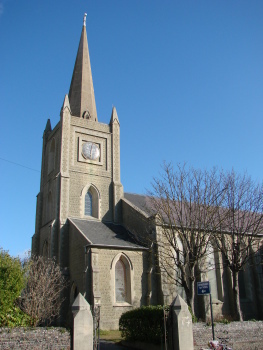 In the re-organisation of the 1870s, St Mark’s was assigned Kemp Town as a parish, as St George’s was still a proprietary chapel. In 1890 W G Scott remodelled it (Clarke papers). His new chancel has a panelled roof. It could only extend to the boundary of the churchyard, so it is still quite short and consequently incorporates the eastern 8ft of the nave. He removed the side-galleries in the nave and in their place he designed transepts (WSRO Ep II/27/98) (only the south one, which has a double gable, was built) and a west gallery for the school. 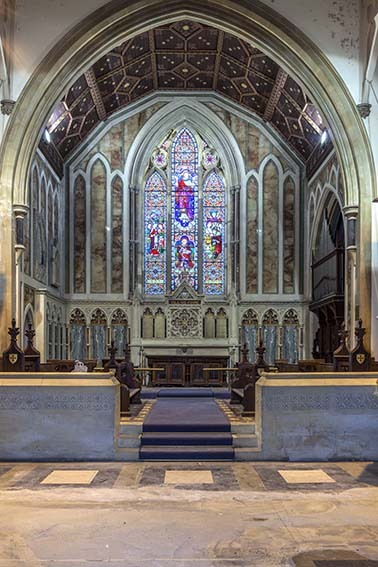 The new work is of rough-finished ragstone in correct Decorated style and the south transept arcade has a polished granite pier, but there is nothing similar on the chancel arch. The chancel walls were clad in marble in 1913 (inscription). 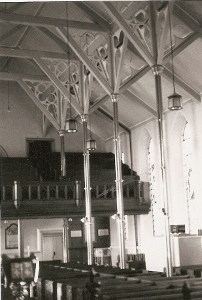 After redundancy in 1985 it was made over to St Mary’s Hall, which made changes, including the removal of seating, before using it as an arts centre and chapel until the school closed in 2009. The church was never consecrated and thus reverted to the direct ownership of the parish of St George’s. 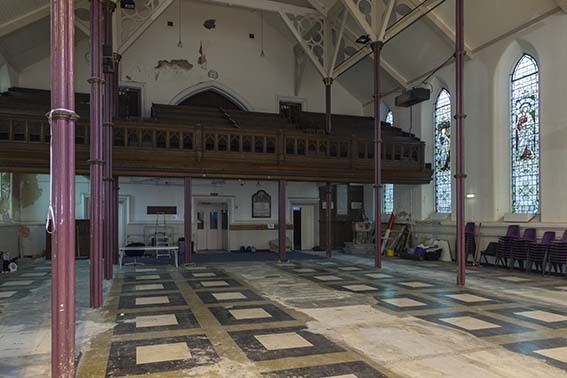 After closure of St Mary’s Hall a plan was announced in the press for the church or its site to be taken over by the nearby Royal Sussex County Hospital as part of its redevelopment and expansion plan. In order to maintain its charitable status, services were for some time in 2015 resumed on Mondays. while an alternative planning application was made to Brighton and Hove City Council for conversion into a community arts centre; the architects are HMDW Architects Limited. This has now been established under the name ‘The Spire’ and performances take place regularly, though there are plans for further conversion and development, which are planned to proceed in stages. Font: Red alabaster octagonal.bowl on grey shafts. 1. 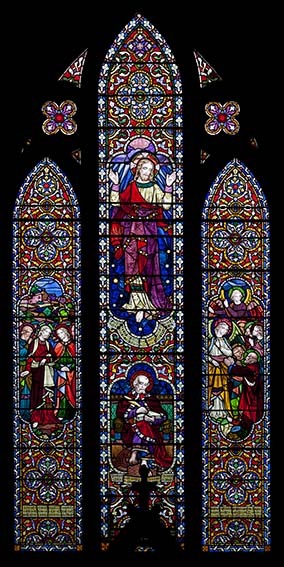 (East window) 1859 by Lavers and Barraud (Antram and Morrice p152) in memory of the Marquess of Bristol. Brightly coloured scenes set in ornamental glass. The date shows it to be reset. 2. 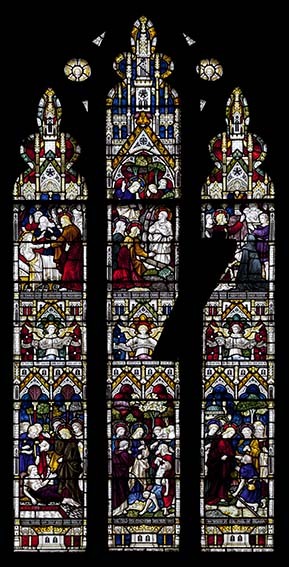 (South transept south windows) Both by Clayton and Bell (Clarke papers). 3. (Lancets of both aisles) Heaton, Butler and Bayne (ibid).Individual figures. Monument: (Chancel) Marquess of Bristol (d1859). Tablet with lengthy Latin inscription. Reredos: 1913. Of marble, like the rest of the chancel, incorporating mosaic work.